This is a short post on herb gardening for beginners, and I came up with the 3 best herbs for getting started with in an organic culinary herb garden. Hey guys it’s Phil from SmilingGardener.com and today I wanted to make a video about herb gardening for beginners, before I get into that if you haven’t pick up the 15 Vital Organic Gardening Lessons For Becoming A Better Organic Gardener you can do that over on the main page of SmilingGardener.com and those are just lesson when I’m first studying organic gardening I thought were really cool and I still think they’re cool so I put them together for you for free. So you can get those for free there. So herb gardening for beginners, what I was thinking is it its kinda neat to put together what I think maybe three of the best herb for beginners to start with when they’re putting in a culinary herb garden and I’m actually gonna ask you for help on this because it’s really difficult narrowing it down. I have – I don’t know maybe 15 to 20 variety of herbs in my garden and I think most of them are really pretty cool and it was kinda tough so what I did is I tried to move in to the shadows here. I tried to come up with some guidelines to make the decision easier. So the first thing I thought was it be really good to start with Perennial for people. Perennials are herbs that you can plant you know plant them once harvest from them that year and also harvest from them on future years too. They’ll keep coming back from you. And so I have some annuals here or what are annuals at least in my garden where I live that I love like basil is one of my absolute favorite herbs. I have this bigger leaf basil and this smaller leaf basil, I also have a purple leaf basil over in another bed. You know I have dill right here which is an annual here which is really nice so those are two of my favorite herbs but they’re annuals and I thought well let’s stick with perennial herbs that makes a lot more sense to me for beginners. I also wanted herbs that were very easy you know something like a rosemary. At least where I live it usually has to be brought in, in the winter coz it usually doesn’t like our harsh winters. So that’s a bit of work to bring it in and then you know plants have a tougher tights inside so it can get unhealthy especially Rosemary in the winter and you got to bring it outside over the spring so its a lot of work so let’s stick with things that are easier. I also thought stick with things that are really useful in the kitchen like I have a couple things like I have a tarragon here which is a pretty neat herb I don’t find that I need – that I use it that often in the kitchen. Same with my savoury which I really do love but I just don’t find that I use it that often so I think that ok let’s stick with herbs that are really useful in the kitchen that we use all the time. And then last I also wanted something that’s pretty common, that’s easy to find. I stayed away from things that you would direct seed. I just – I went for things its good for beginners just go buy them from a garden centre so I wanted some common herbs. And so with that I think what I’m gonna do is show you coz I want to keep the video shorter. I’ll show you one of them and the other two you can go if you’re not already in my website I’ll put a link down below you can go check them out in the website because I wrote some detail about them what they’re useful for. So the – let’s see, the one here that I thought would be really useful to start with is chives. 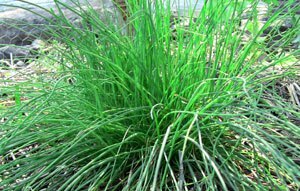 So chives are you know very useful in the kitchen you can use them raw or cook or you know other kind of things. They’re very easy in the garden once you plant them you can kinda forget about them and they’ll keep coming back, they’ll self seed, they can take a little bit of shade so they’re, they’re kinda bit easy they’re not quite as medicinal like the other- the other two herbs that I put I my site are/have some nice medicinal purposes. Chives are good for helping your digestion and increasing/improving sort of increasing your appetite. But they’re not quite as medicinal but there is one really cool thing about them and that is that they are apparently a pretty good insect repellent if you can get the juice out of them. I think catnip should be better, catnip suppose to be really good but chives are supposed to be ok too so what I’m gonna do is I’ll set you down here. You can – you are cut out from my garden by my rabbit fence and I’ll – I’ll just want to harvest a little more. I’ve actually are been doing a little bit of this morning which is trying to extract some of the juice out of these chives so I put just a little bit of water in here I think this will work much better with a hand blender but I just put a little of water in there and I’ve been doing a little bit of this. And I think I just kinda get my spoon in there and putting them down that’s why a hand blender would work better but what I can do now is just take these stuff, put it in a jar, there’s all kind of juice in there and try to use that as an insect repellent because it’s getting to be mosquito season. So I’ll see how that works. I know the catnip works well. Yeah so my other two, the other two I wrote some detail about them at SmilingGardener.com while you’re there you can pick up the 15 Vital Lesson For Becoming A Better Organic Gardener and also if you have sort of three herbs that you think best for people to start out with, it will be great if you could let me know below and that’s all for now, I’ll see you next week. Perennial. While herbs like basil are dill (they’re annuals where I live) are some of my favorites, I think it’s a great idea to start with perennial herbs that you can plant just once and harvest from throughout the year, every year. Easy To Grow. Rosemary is nice, but difficult to maintain in colder climates (it may need to be brought inside, which can cause problems). If you’re just starting out, I think you’ll want to start with the herb plants you can put in the ground and not worry about. Often-Used. 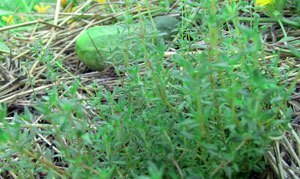 I have a nice tarragon in my garden, but I rarely use it in the kitchen. I figure it’s good to start with garden herbs that are used often in your cooking. Easy To Find. I didn’t go for plants that are direct seeded outdoors. Most herb plants are better started inside anyway. Instead, I went for garden herbs that you’ll easily find in the garden centre, as that’s the simplest way to start your organic herb garden. 1. Chives. Related to onions and garlic, chives are actually a small bulb, but you use the above-ground leaves in the kitchen. They are very nice in many dishes, raw or cooked. Once you get the plants going, you can ignore them and they’ll continue to grow in your home herb garden. They’ll self seed, too. Not as medicinal as the others below, but chives are good for digestion and improve the appetite. They’re also used as an insect repellant. Full sun or a touch of shade. 2. Oregano. A staple in sauces, we use oregano all the time – fresh and dried. It’s often used dried in the Mediterranean. 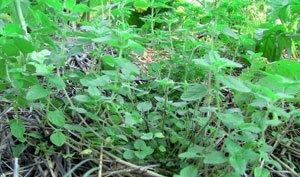 Apparently, most dried oregano from the store is actually from others plants – mostly Lippia and Origanum (same family, but a different plant). Great for herb gardening, as it attracts insects and has a whole whack of medicinal uses. It really helps the digestive system. Not great in medicinal quantities for my cousin Kari though (8+ months pregnant). Full sun or a touch of shade. 3. Thyme. A staple in herb gardens that is great in sauces and attracts insects. It’s mostly used in cooked foods. The oil in the leaves is an antiseptic and disinfectant. You can even walk on some varieties and they will be okay. A good choice for herb gardening for beginners. Needs full sun and doesn’t like wet feet. So those are my picks, but more important, I want to know yours. If you’re into vegetable gardens, what are your top 3 herb plants that people should start with in their organic garden? Lovage is new in my garden, planted last year and flowering this year. I hope it reseeds and continues to find a home with me. While celery is not easy to grow, the same flavor notes can be had from lovage. A few leaves with my salad greens and I have that celery taste. I have had lovage for years, and it is great, but careful to watch where is reseeds!! I love Vietnamese cilantro. Here in Texas, it comes back every year, but up north farther I didn’t have such luck. Parsley! I love to let it go to seed all over the garden so there is always lots to harvest. Here in south coast BC it often survives very well even through a prolonged freeze in the winter and in Ontario I’m sure it would be one of the first herbs to germinate once the soil warms up. A friend taught me to make a simple and delicious tomato sauce for pasta from tomatoes, olive oil, garlic, and lots of parsley that was then topped with a dollop of basil pesto. And you can snip a bunch of stems and put them in some water for a parsley bouquet that is always on hand in the kitchen. I find that good organically grown parsley will last more than a week in water in a cool part of the kitchen. Hi Natasha, i like your post on parsley, i have often wondered how else can use it and am glad that you shared the tomato paste receipe, do you have specific measure ments and would you mind sharing the recipe. Thanks. Thanks for the ideas! I’ve already got chives, but not thyme or oregano. Maybe next planting season (hopefully they would survive the Saskatchewan winter too). My perennial herb of choice is mint. I don’t use a lot of it in cooking, but tea from fresh mint leaves is great. I’ve got spearmint, regular mint, chocolate mint, and pineapple mint. The only problem with mint is you need to show it who’s boss – it tries to take over my flower bed, so every year I have to cut it back and pull some out to keep it from spreading too much. Sage is another easy to grow perennial herb. Used in Italian cooking, as well as traditional stuffing for Thanksgiving turkey; try sage and butter sauce with Parmesan cheese grated over ravioli – delicious! Sage likes sun, doesn’t like wet roots, and survives cold temperatures beautifully in well-drained soil. I’m going to second Pattmair’s suggestion of lovage.I planted it for the first time this year and absolutely love it. It grows easily and produces lots of celery-flavoured leaves and stems. I’ve been dehydrating them for use in soups and stews over the winter. My favorites are parsley, thyme, basil, cilantro. Clad to see others suggesting parsley; they bloom and self seed. Basil also self seeds also cilantro. Eating organic food is a great step towards ahealthy lifestyle. Unfortunately, many organic fruits and vegetables are a bitmore costly. To combat the increased cost, and to ensure that the food you areeating is 100% organic, you may want to start your own organic garden. I’m hungry after reading those comments. I agree with you, Phil, that chives, oregano and thyme are good starters and the herbs most likely to be used. Basil and lavender are also in our garden. Speaking of chives … garlic chives in particular are great to plant under/near your rose bushes as they prevent black spot. I have one yellow rose bush in a large wooden container (along with garlic chives) and I’ve never had such beautiful roses … and no spots on the leaves. the three herbs i could not live without are sage (use it for sore throat in teas), lovage (stews, soups etc.) which comes back year after year even after very cold winters. sure hope it will grow here in florida where we just moved to. the last one is rosemary . In the El Paso desert this was one that turned into huge bushes in no time. I think it will do just as well here in florida. In colder climates pots would be the way to go to bring them in during winter.Love your blog by the way. Just discovered your blog via the kitchen gardeners. Being an organic gardener doesn’t require ahuge amount of space. Even living in an apartment with a small patio or porchyou can accomplish container and small space gardening to grow your organicproduce. All of these are wonderful lavender is wonderful just a pinch in guacomle makes a huge change and is wonderful. Thank you for the great ideas. Thanks Phil, for the information. My beginners list for herbs is currently Rosemary i live in the tropics read sub saharan Africa and it does well in all weather and especially when it rains though this year we had a very harsh dry weather and almost thought it would dry completely because it was attacked by termites but now we have our long rains and it looks very lovely.I have lemon grass also doing very well now and was affected during the dry weather, the other herb i have is lavender it smells so nice and use to bath, it is often attacked by aphids during the day season probably you can give me some tips on how to protect it during the dry season. I also have tarragon and i agree with you i rarelt use it in the kitchen, it was the worst hit during the dry season however now with the rains it is blooming and it s bushy. Hi, love your article, I absolutely love coriander in my herb garden. just planted a new crop from using the seeds from the last crop… looking forward to seeing them grow. If trying to go organic is buying herb and vegetable starter plants from a garden center a bad thing when they are not labeled organic? No, it’s not the end of the world. I often do this if I can’t find a local organic market or something like that.